Summary: This project is the third phase of the Sea Turtle Education and Dark Sky Awareness campaign. Educational materials were produced with Sea Turtle Grant #09-037E and #11-014E. ERM will expand the educational campaign by hosting a Dark Sky Festival. This event will focus on educating the residents and visitors of Palm Beach County on the harmful effects of light pollution and will provide the resources for change. The free public event will emphasize the effects of artificial lighting on astronomy, possible links to human health and impacts to wildlife, with emphasis on local sea turtle populations. A wide range of exhibitors including lighting design firms, environmental organizations and local experts will be invited to participate. The schedule of events will include activities such as a free screening of ?The City Dark? a documentary about light pollution and the disappearing night sky, discussion from a panel of experts, a photography exhibit and a ?star? party. Funding is for a press kit, public screening fee, and venue fees. Results: Palm Beach County's Dark Sky Festival Celebrate the Night and Turn Down the Lights was very well received. With approximately 1,000 guests in attendance, the festival reached a diverse demographic audience. Festival participants were able to experience the importance of conserving the night sky through guided nature walks, live birds of prey presentations, a lecture series, lighting displays, a documentary screening, celestial observations through telescopes, a photography exhibit, educational posters and exhibitor's booths. Exhibitors educated and entertained guests throughout the duration of the festival. International Dark Sky Association, Palm Beach Chapter (IDA-PBC) provided a lighting demonstration and distributed educational material regarding light pollution. Argent LED provided examples of "Dark Sky" and turtle friendly bulbs and light fixtures. John D. MacArthur Beach State Park, Loggerhead Marinelife Center and Gumbo Limbo Nature Center provided information on local sea turtle conservation. South Florida Science Museum entertained children with a hands on galactic ooze station. 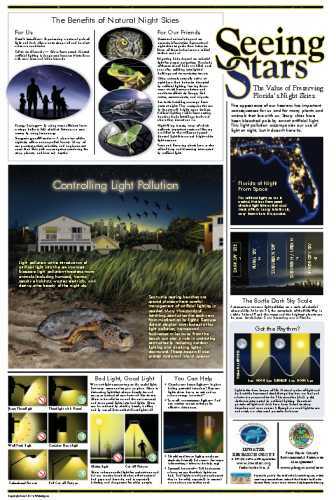 Florida Atlantic University students presented posters that emphasized the impacts of light pollution on human health, birds and astronomy. South Florida Amateur Astronomical Association set up telescopes on the back lawn to give participants a glimpse of distant stars and planets. Audubon and Palm Beach County ERM displays focused on native wildlife. Florida Fish and Wildlife brought their Lighting Trailer and displayed examples of wildlife friendly lighting.